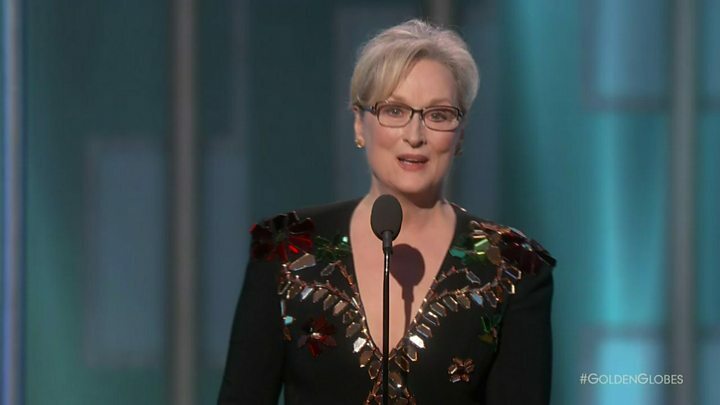 US President-elect Donald Trump has hit back at Meryl Streep's criticism of him as she received a lifetime achievement award at the Golden Globes. He tweeted: "Meryl Streep, one of the most overrated actresses in Hollywood, doesn't know me but attacked last night at the Golden Globes. "She is a Hillary flunky who lost big," Mr Trump added of the three-time Oscar-winning actress. She said: "When the powerful use their position to bully others we all lose." The hostility towards Mr Trump from the world of showbiz contrasts with the feting of his defeated rival in November's presidential election, Hillary Clinton. 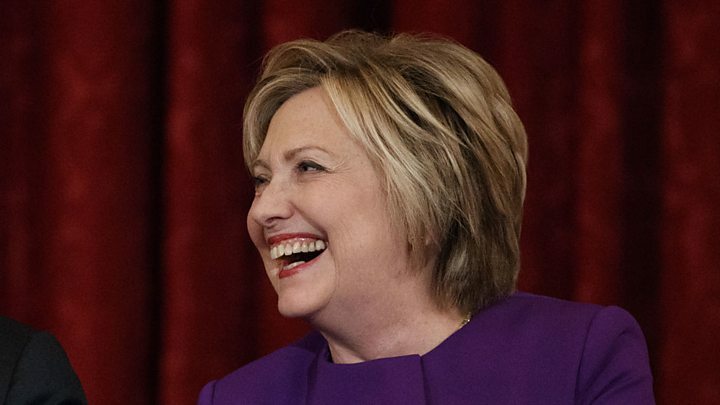 She received three standing ovations as she made a rare public appearance on Sunday in New York City at the Broadway musical The Color Purple. Streep told the Golden Globes audience in Beverly Hills on Sunday as she picked up the Cecil B DeMille award: "You and all of us in this room really belong to the most vilified segments in American society right now. "Think about it, Hollywood, foreigners, and the press." "There was one performance this year that stunned me," she continued, without naming Mr Trump. "It sank its hooks in my heart. Not because it was good. There was nothing good about it. But it was effective, and it did its job. It made its intended audience laugh and show their teeth. "It was that moment when the person asking to sit in the most respected seat in our country imitated a disabled reporter. Someone he outranked in privilege, power and the capacity to fight back. Streep was referring to a rally in South Carolina in November 2015 when Mr Trump jerked his arms in front of his body as he made fun of Serge Kovaleski, a New York Times journalist who has a congenital joint condition. The actress' attack dominated coverage of an event that is usually a light-hearted jamboree in the annual Hollywood awards season ahead of next month's Oscars. Mr Trump, who will be inaugurated in less than two weeks, tweeted on Monday morning: "For the 100th time, I never 'mocked' a disabled reporter (would never do that) but simply showed him 'groveling' when he totally changed a 16 year old story that he had written in order to make me look bad. Just more very dishonest media!" Off to Washington for the inauguration? Streep also referred to Mr Trump's hardline stance on immigration policy. The actress told the audience: "Hollywood is crawling with outsiders and foreigners and if you kick them all out, you'll have nothing to watch but football and mixed martial arts, which are not the arts." Hollywood musical La La Land broke the record for the most Golden Globe Awards. It won seven in total - succeeding in every category for which it was nominated. Emma Stone and Ryan Gosling won in the best acting categories, while Damien Chazelle was named best director. The movie also won the best musical or comedy film award, best screenplay, best score and best song. Coming-of-age drama Moonlight was named best film in the drama category, while best actor and actress went to Casey Affleck and Isabelle Huppert. British stars dominated in the television categories, with prizes for The Night Manager and The Crown. Three stars of BBC spy drama The Night Manager - Tom Hiddleston, Olivia Colman and Hugh Laurie - won acting prizes. Claire Foy, who plays the Queen in Netflix's royal epic The Crown, was named best TV drama actress and the show won best TV drama.